Weeding is a lot like cleaning a house--it's not fun, but things look so much better after you do it. That being said, there still comes a point where practically every gardener has gotten so fed up with digging and pulling weeds, that the idea of putting down weed matting is almost irresistible. Clear the area of all weeds, debris and old mulch. Level your soil at least 3” below the grade of your finished edging, lawn, or pathways. Leave plants in place. Now is the time to add compost and composted manure to make the soil as nutritious as possible. If you have new plants to put into the bed, wait until after you have laid down the mat. Use a high-quality woven landscape fabric. It allows water and air to penetrate and, it will last a long time. 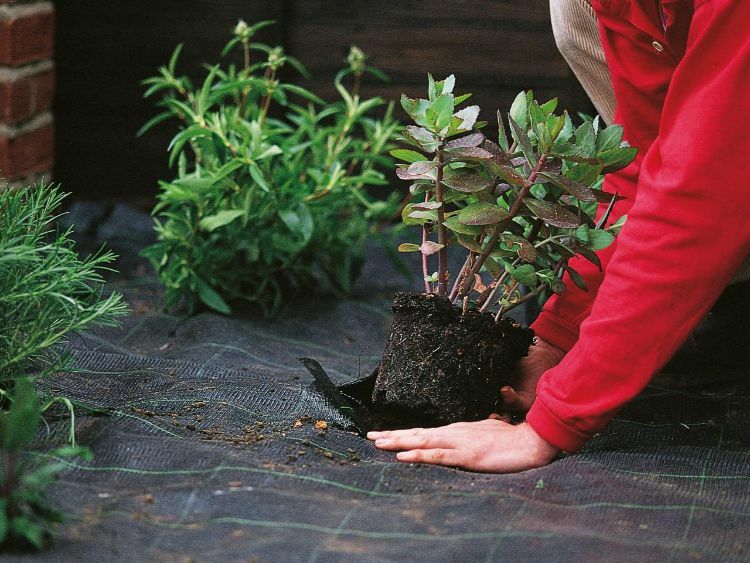 Plastic sheets and cheap, see-through materials will allow weeds to break through, and your plants won’t get the water and nutrients they need to survive. If you are using multiple strips of fabric, overlap them by about one foot so that weeds can’t squeeze through the gaps. Cut the matting so you have about one inch or so to fold up at your edging or pathway. You’ll have your soil 3” below the grade of your finished edging and pathways, so the additional inch of landscape fabric will be totally hidden by mulch when you’re finished. Pin the fabric to the ground, spaced every foot, all along the edges. Measure your beds so you buy enough pins. You'll be cutting holes in the fabric for existing plants and new ones, so you might want to pin the edges of the cutouts and overlaps so they aren't loose and flapping in the wind. Perennial plants send out new shoots from their roots, so make sure the hole around them is not so small that it keeps them from spreading. The same is true for ornamental grasses, which need a solid base from which to grow. Check these plants every year to ensure that you don't have to remove more fabric around the base of the plant.